I had not expected to have a Thanksgiving this year, and the day itself passed uneventfully. 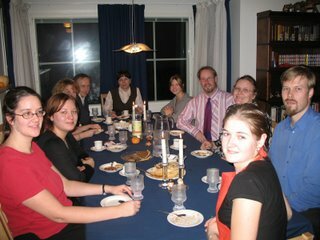 But I was invited to a real American Thanksgiving dinner on Saturday night, where a lively group of Finns, Brits, and Russians gathered for turkey with all the trimmings: stuffing, potatoes and gravy, sweet potatoes, corn, peas, Finnish cranberries, and four pies—two apple, two pumpkin. As the American, or maybe just as the most senior citizen, I was allowed to carve the bird. Thanksgiving is my favorite holiday by far, not just because of the feast but also because of the requirement that we count our blessings. It is “meet and right so to do,” as we Episcopalians are wont to say. I have always thought that America could be a little more aggressive in exporting this fetching holiday. Then again, maybe the idea of marketing a tribute to humility is way too oxymoronic. Anyway, I noticed that everyone at the event on Saturday night seemed to understand the spirit of the occasion, so maybe Thanksgiving is catching on internationally without our making much of an effort. 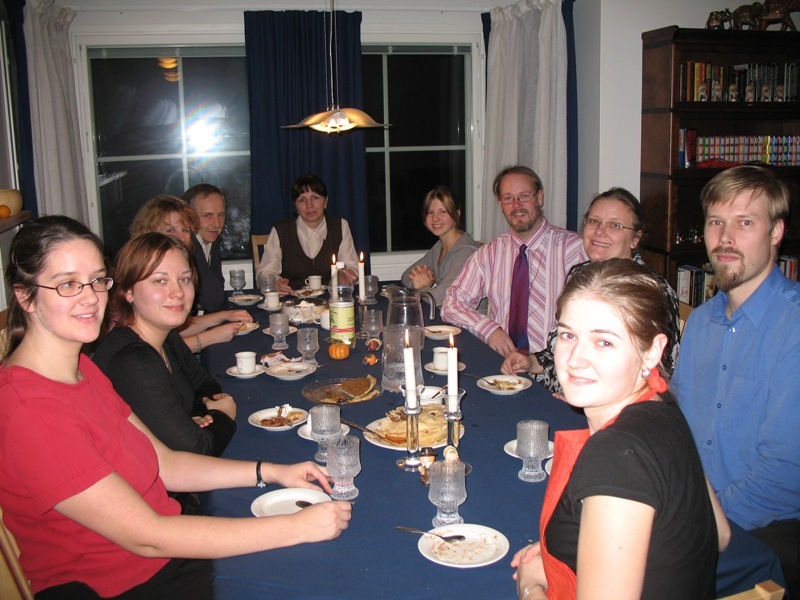 Children, most of them bilingual or trilingual, loomed large at this Thanksgiving feast. They wouldn’t have sat still for a photo, so you’ll have to settle for the grown-ups, pictured above. A fine time was had by all, particularly by this innocent abroad.